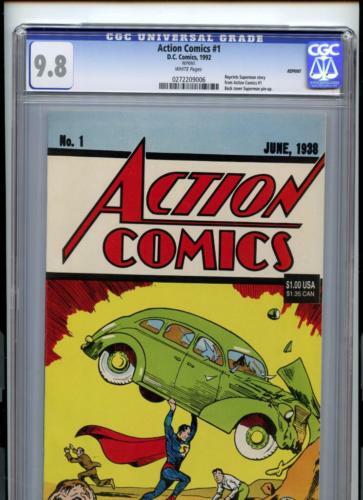 This is a reprint of Action Comics #1 (1992; CGC 9.8) with white pages from DC Comics. Back cover superman pin-up! We only accept Paypal for purchases. Items must be paid for within 7 days of first purchase to avoid unpaid item case being opened and the item being relisted. Items will be shipped within 24 hours of cleared payment! We offer combined shipping on all multiple purchases. Please wait to pay until we have sent an invoice. Great care is taken in the shipping and handling of all items to insure that they reach the customer in the same condition as advertised. A three dollar item receives the same care as a three thousand dollar item. We value customer satisfaction. Any item that is purchased from us may be returned within 30 days for a full refund if you are not satisfied. Items must be returned in the same condition as received. We ONLY ship in boxes. We do not use bubble mailers or envelopes. Single comics are shipped First Class or Priority Mail depending on which method you prefer. Priority Mail is faster but First Class is cheaper. Anything up to 1 pound can be shipped First Class. Once the weight goes over 1 pound, we have to use Priority Mail. As the Post Office increases their rates, we will do our best to save you money on the shipping cost. Shipping cost will depend on location and the weight of your order. Orders shipped to the Mid-West and West Coast will cost more than orders shipped to the East Coast. We do not send comics by media mail. It is unsafe and against postal regulations. International shipping cost will depend on your location, as well as the weight and value of your order. We send all items First Class International mail until the package reaches a heavier weight (4 pounds or more) and then we must use International Priority Mail. Please keep this in mind if you are considering buying a large lot of comics or a larger toy. In many cases, the shipping cost may be more than the item cost. We will give you the lowest shipping price possible. All international orders requiring a customs declaration will be declared at full value. Please do not ask us to declare a lower value or declare your shipment to be a gift. Import duties and taxes are not included in the item price or the shipping charges. These charges are the buyer's responsibility. Please check with your country's customs office to determine what these costs could be prior to buying. If you have any questions or concerns regarding shipping, please contact us prior to your purchase. We appreciate your business and want to make sure you are 100% satisfied with your order. While we do our best to catch details in the listings, sometimes mistakes do occur. If there are any problems with your order, please contact us BEFORE going through Ebay's resolution center. We will correct any issues and ensure your 100% satisfaction.